Indictment filed against resident of Majdal Shams, who passed sensitive information on IDF border activity to the Assad regime. An indictment was submitted on Friday against Sidki al-Makat, a 48-year-old resident of the Druze village of Majdal Shams in the Golan Heights, who is charged with spying on Israel for the regime of Syrian President Bashar al-Assad. According to the indictment, details of which were revealed after a gag order was lifted, al-Makat transferred photographic materials, reports and surveillance information regarding the IDF's activities in the Golan to Syrian intelligence sources. The spy passed the information by uploading it to the internet, having it published on Syrian TV, and direct contact with sources in Syria. Al-Makat was arrested last month in a joint operation involving the IDF, Israel Security Agency (ISA) and the police, and was charged with severe espionage, aiding an enemy at a time of war, supporting a terrorist organization and contact with a foreign agent. He was arrested for the first time way back in 1985, on charges of taking part in hostile terrorist activities against Israel. As a result he sat in an Israeli jail for 27 years, until being released in August of 2012. Clearly, the long stint in jail did not deter him from returning right back to his subversive activities, a point indicating the easier prison conditions enjoyed by jailed terrorists as opposed to jailed criminals. Under investigation, al-Makat admitted that he gathered information on IDF activities on the northern border and published the materials online, as well as on a Syrian TV program. He also admitted to being in contact with Madhat Tzalah, a member of the Syrian government known for his connection with the country's intelligence service. Israel and Syria have officially been at a state of war ever since the Jewish state liberated the Golan Heights back in the 1967 Six Day War, with the region annexed by Israel in 1981. 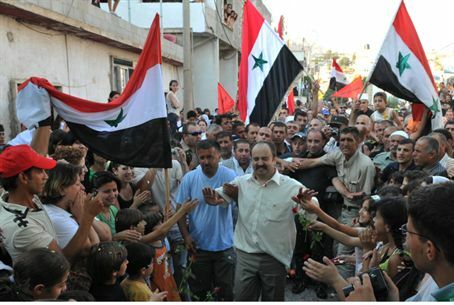 Majdal Shams is one of the Syrian Druze communities in the area, which number at 18,000 members and have been noted for maintaining their loyalty to Syria, refusing Israeli citizenship.